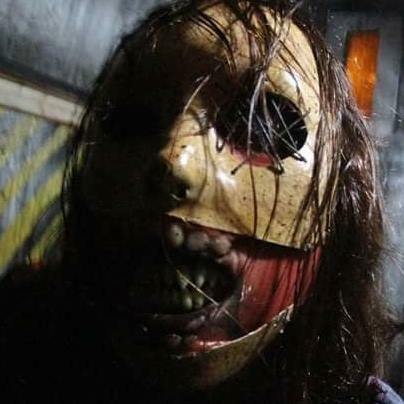 Haunted Houses in Detroit, Michigan are some of the scariest haunted houses in America. 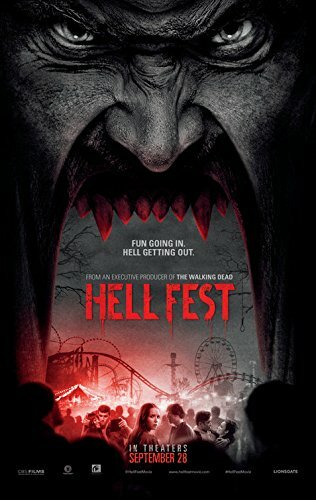 Hauntworld.com tries to review only the best haunted houses in Detroit, Michigan. 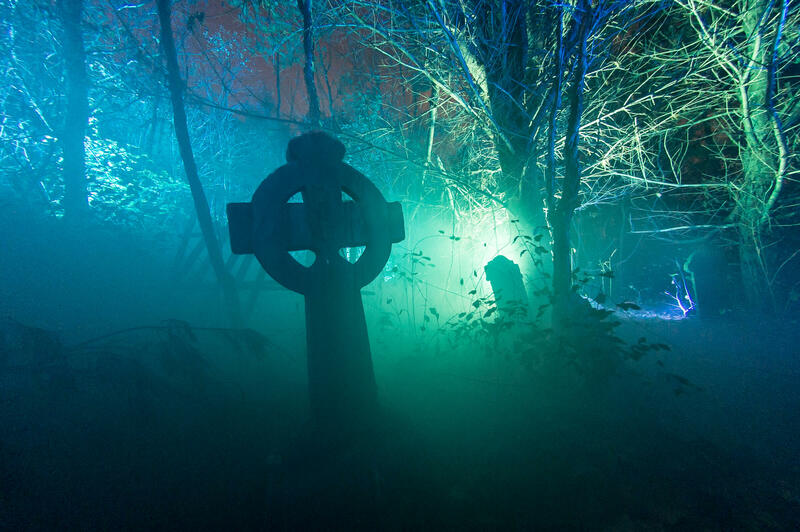 When you are looking for simply the best, scariest, haunted houses in Michigan there is no other place to search than Hauntworld.com which offers our guests the best information to find Michigan Haunted Houses including the best haunted attractions in Detroit, Michigan. 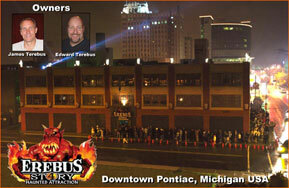 There are many haunted houses in Detroit that claim to the best haunted attraction but only one can truly lay claim to the being the scariest haunted house in Michigan... Erebus - 4 Story Haunted Attraction in Detroit, Michigan. - EREBUS by Webster’s definition is the darkness beneath the Earth that the dead must pass to reach Hades.- In Greek mythology Erebus is the son of Chaos and the brother of Nye (Night) Every so often you hear about a haunted house that really gets you interested…something unique, something wild! For years I had heard about a place in Michigan with some really unusual scares; bottomless pits, crushing walls and giant monsters that would actually EAT you! Well the place is for real it turns out, and I actually got a behind the scenes tour of this massive attraction by Ed Terebus the Co-Owner (with his brother Jim) of EREBUS Haunted House in Pontiac, Michigan. The brothers Terebus have been in the haunting game a long time. This is their twenty fifth season of terrifying folks, and over the years they have created an over the top style that really stands out. Throughout their history the brothers have been primarily operating portable haunts, notably the Haunted Gallery, (a trailer based haunt), before the move to a permanent location 5 years ago. And what a location they found! The building is a former 4 story parking garage that had been abandoned for almost 50 years and used as an indoor junkyard! The haunt currently fills about 30,000 square feet of the 100,000 square foot structure, with the rest used for storage and shop space. Believe it or not they need almost all that space to house the vast collection of props and raw materials they have amassed over a quarter century of haunting. 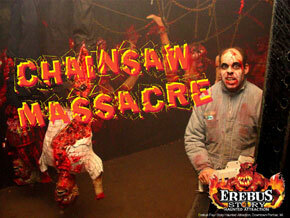 I was astounded by the size and quality of their effects shop, occupying a huge room bigger than many full sized haunts!But the power of EREBUS does not rest on what lies backstage, it can be observed in the way they engage their guests in an all out assault on the senses. 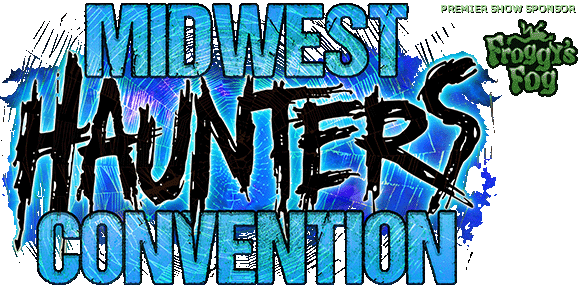 The metro area surrounding Detroit has over 75 different haunted events (give or take) each year, an astounding array of all sizes and budgets. 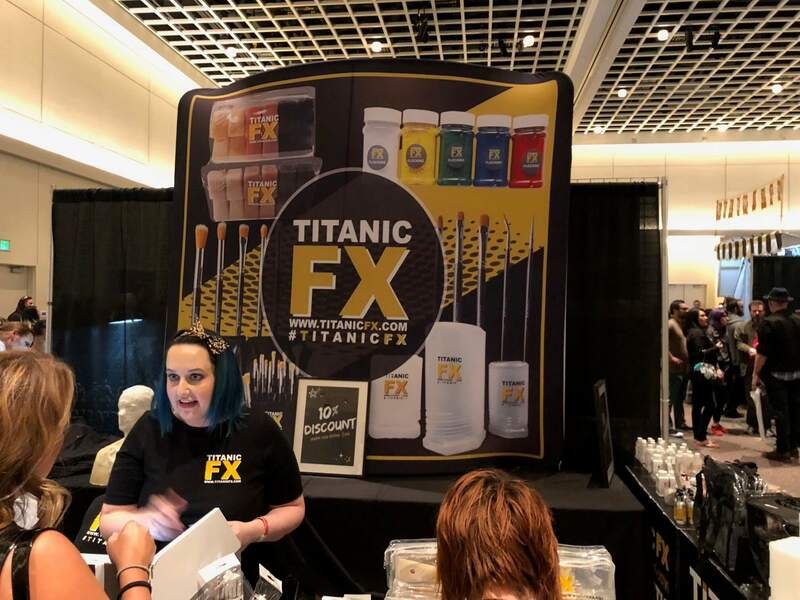 Since many of these attractions purchase heavily from industry vendors, duplication of popular props and effects is inevitable in the market. To counter this, EREBUS manufactures in house most if not all of their major effects, allowing guests a more unique experience. One way to describe the gags in their show is BIG. With space on their side, many of the effects involve large moving props or set pieces that interact with the guests on a huge scale. Their take on the popular “vortex” for example is a 20 foot plus enclosed room that rocks from side to side, with light beams raining down on the guests to create a disorienting effect. 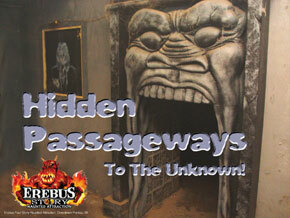 Like many major haunts, EREBUS strives to change key effects from year to year, but their core theme remains the same. Guests are sent through time by a mad scientist in the show intro, an event that culminates in a vicious surprise aerial attack from a 12 foot long giant centipede like monster! From the dawn of civilization they pass through many ages of history and different cultures, traveling through time back to the present. A few events you might experience: - An ornate temple in India conceals a rampaging rhino...you had better get out of the way! - A primeval jungle is home to attacking monkeys - avoid the weird dwarf leg gripping mutant demon ape if you can!- In a strange rune covered catacomb, opening and closing walls must be passed to escape a series of chambers. If you hesitate you may be crushed! (in a matter of speaking…the dangerous appearing walls are actually soft - but the apparent danger is intense)- Traveling along a cliff face, a moving wall pushes you close to a bottomless pit in a clever mirror gag.- In one of the final events, a dragon with a 10 foot mouth emerges from the gloom and EATS patrons…dragging them screaming into the darkness! Many other classics are present in EREBUS, done up in a grand scale - the elevator gag, (With multiple elevators to allow good throughput) Pepper’s ghosts, drop panels, and a massive Tesla Coil to name a few. Last year in a new scene, they actually buried guests alive ! (In an effect that seems to resemble the classic burial effect from the old ASYLUM experience in Chicago)Ed Terebus has likened a trip though EREBUS to an obstacle course in many ways. “ Things will grab them, bite them, and land on top of them, then we’ll bury them alive!” But no matter how intense an effect is, safety remains the prime concern. Each scene goes through constant tweaking, and almost all of them are activated or supervised by employees to ensure no injuries occur. 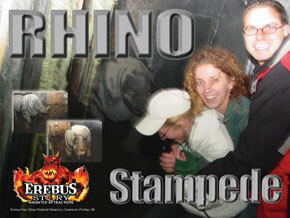 One of my favorite experiences at EREBUS was not a effect at all, but rather a result of the massive building they occupy. About midway through the haunt you begin a spiral decent down what was once a car ramp. They have narrowed the path to about six feet wide, and as you descend a rather steep grade, the temperature begins to lower! You end up in the basement of the building (one of the floors is underground) and the effect of being in a massive concrete almost cave like building is pretty cool.One of the appealing factors about this haunt is definitely the scale of it. 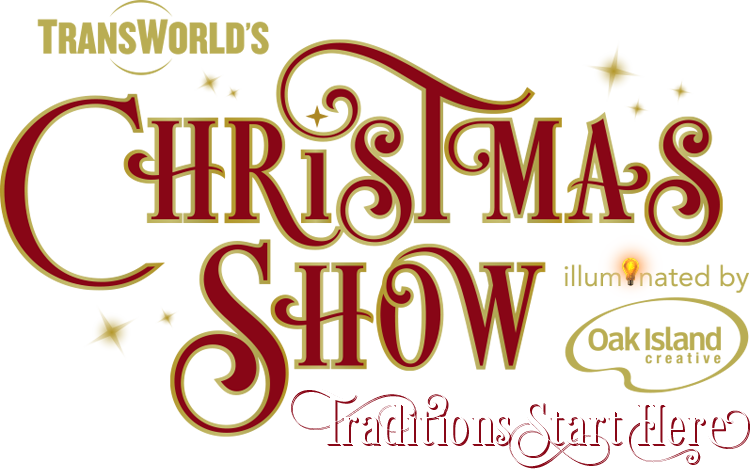 It takes a while to get through the event as you go up and down stairwells and inclines several times - Ed claims a conservative ½ hour trip, but slow moving guests could easily spend much longer. The queue line and staging area is also inside the building, allowing guests to become more immersed in the experience. The first large indoor waiting area features a large projection screen and multiple light boxes for sponsor advertisements to occupy guests. Another interesting thing to mention about EREBUS is the involvement of Ed and his sister in the publication of the FEAR FINDER, a newspaper style publication catering to Michigan haunt enthusiasts. (See related article in this issue) Years ago Ed would encounter excited guests leaving his haunt, (at that time the Haunted Gallery) eagerly asking about where other haunts were located. Tired of drawing maps on napkins, they started the FEAR FINDER, creating a central place for all haunts to advertise. It is difficult to pin down just why there are so many haunts in the Detroit Michigan area, but the advent of a newspaper where every haunt is listed with detailed maps to each location was undoubtedly a factor. In this age of guests who expect more every year, who are increasingly jaded by intense movies and video games, haunters are breaking the third wall more and more. This trend began years ago, with the growth of blasting air at visitors. It went up a notch with water sprayers gaining in popularity, and now many haunts drop insects and worms on guests or find other ways of “touching without touching”. EREBUS has definitely expanded this approach with their giant puppets and moving walls, creating a tactile experience for guests, without the questionable and largely shunned practice of having actors touch patrons. Many would call this increasing invasion of private space “old school” and prefer to avoid the practice. But following the trends set by major theme parks with heat, water and air blasting at you with greater regularity, guests may come to expect it. 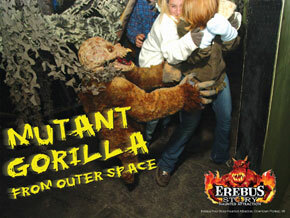 I would recommend a trip to EREBUS for any haunter to experience a truly unique event, and one that with their giant puppets and tactile effects might suddenly find itself on the cutting edge of a new style of haunting. Pontiac Michigan. Housed deep in a massive 4 story structure in downtown Pontiac is a Haunted Attraction unlike any other!Every October, thrill seeking guests throng to the dozens of Haunted events found all over the metro area. 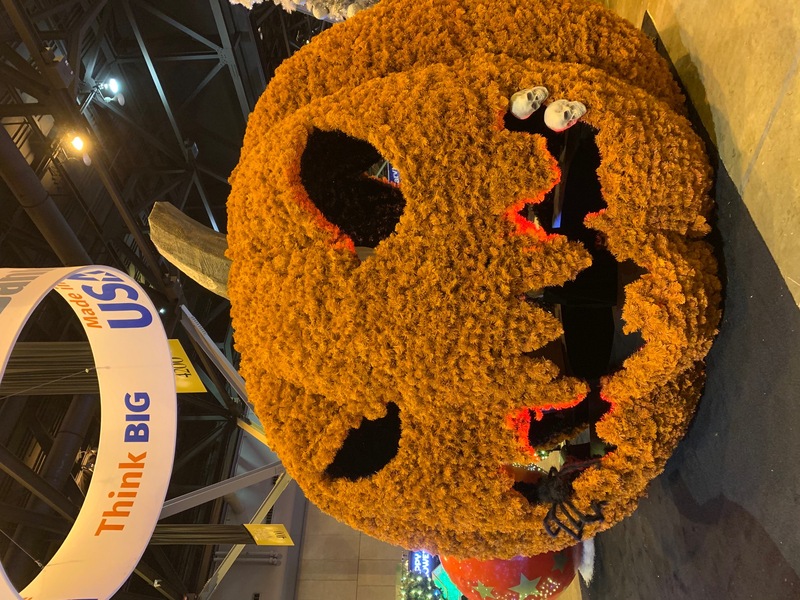 From Mom & Pop hayrides to a high tech, high dollar haunts that push the boundaries of fear, this scary entertainment seems to thrive throughout Michigan. But this reporter has discovered the one that just might be the biggest and scariest of them all, EREBUS Haunted Attraction, holds a dark secret so bizarre that it is almost beyond belief! Several years before this “Haunted Attraction” opened, the formerly abandoned edifice was secretly converted into a research facility by Dr. Edgar Colber. Once renowned for his cutting edge work in non-Euclidian geometry and Mobius engine technology, Dr. Colber quickly amassed a fortune developing black ops projects for the US government. 10 years ago, after his theories grew too strange and “dangerous” he was fired from his research position and vanished from sight. 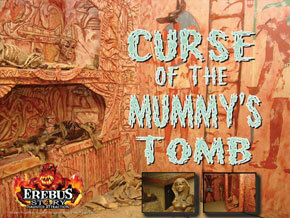 City records show that soon after these events he arrived in Pontiac and purchased the vast building now called EREBUS. According to former employees he constructed a massive Mobius Reactor in the building, apparently to create an actual TIME MACHINE. Colber was obsessed it seems, with attempting to alter the past, and prevent disasters before they ever happened!
" I have exhausted all my finances and resources. Most of my staff has gone missing in the EREBUS device, and I fear that they are dead. Although my equipment is all functioning properly, every team I send in meets with disaster! One group was MUTILATED by carnivorous apes, another CRUSHED by temple walls, a third EATEN by dinosaurs! It is as if nature considers my work to be a virus, and that it is sending antibodies to destroy the infection! I feel the eyes of my unseen ENEMY upon me! Even now it plots to enter this world and destroy my work! But I will be victorious! 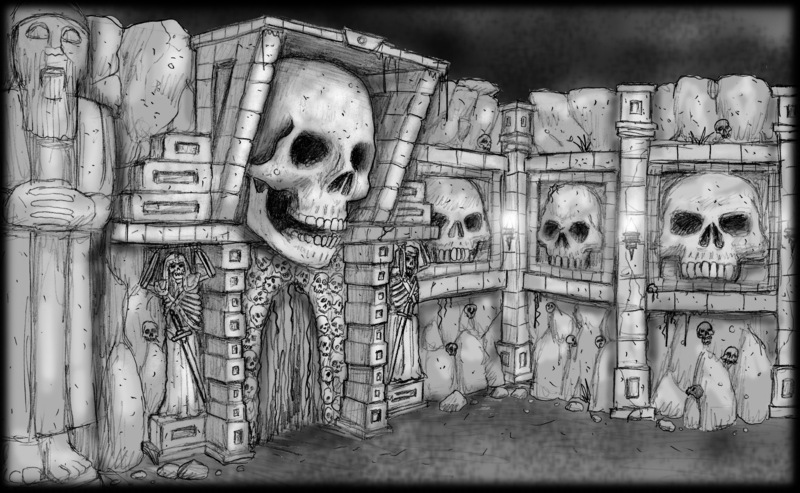 I will advertise EREBUS as a Haunted House - then I will send my guests back in time - unknowingly they will act as pawns in this brutal game…I will observe their grisly deaths and discover the true nature of my enemy! Then once I have mastered TIME I will bring them all back to life and reward them for their sacrifices…unless the ENEMY destroys me first! I dream of it..a huge burning monster that shows no mercy! But it is I , Dr. Edgar Colber that will be have the last laugh! " As you can see, it is clear that the owner of EREBUS has lost his mind. We advise all readers to avoid this place until the proper authorities can be notified!